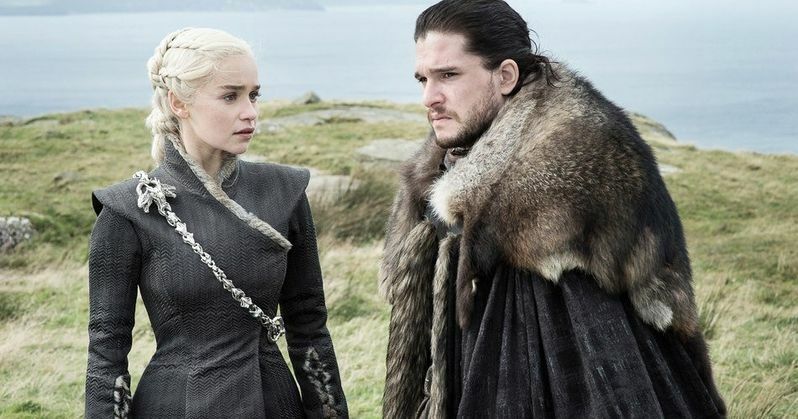 Game of Thrones Season 8 first look photo features Khaleesi and Jon Snow. While we still don't know when the hit HBO show will be premiering next year, the promotional campaign is getting ready to launch, which should get fans very excited. It's been a longer wait than normal for the eighth and final season, but from the sound of things, it will be worth it in the end with longer episodes and a different attitude towards filming what will be the last episodes that fans ever see. Daenerys (Emilia Clarke) and Jon Snow (Kit Harington) appear on the latest issue of Entertainment Weekly in the first look from Game of Thrones Season 8. While the photo doesn't give anything away about the upcoming season, it's important to note that HBO is getting ready to promote the show, which means that a teaser trailer can't be too far down the line. This is pure speculation, but first look images are usually followed by a full promotional campaign. Details about Game of Thrones Season 8 are being kept under wraps for the time being. Since the series is always shrouded in mystery, fans are speculating about what will happen next, and obviously, who will die. While he couldn't give out any specific details, co-executive producer Bryan Cogman talked about what fans can expect. He had this to say. "It's about all of these disparate characters coming together to face a common enemy, dealing with their own past, and defining the person they want to be in the face of certain death. It's an incredibly emotional haunting bittersweet final season and I think it honors very much what (author George R.R. Martin) set out to do - which is flipping this kind of story on its head." It took 10 months to shoot Game of Thrones Season 8, and it was a grueling process for the cast and crew. The show is currently in the post-production phase, and it's believed that the crew will be working on just the CGI until late May of next year, which is about when the series is expected to make its debut. Kit Harrington had this to say about filming the last episodes. "It's relentless; scenes that would have been a one-day shoot five years ago are now a five-day shoot. They want to get it right, they want to shoot everything every single way so they have options." Emilia Clarke also spoke about how crazy filming the final scenes for Game of Thrones Season 8, noting that even the camera checks took longer in an effort to make sure every little detail about the show was done correctly. The actress noted that the costumes are better as well as the hair and makeup, which took the attitude towards the show in a different and "intense" direction. You can check out the first look image from Game of Thrones Season 8 over at Entertainment Weekly.